i made good use of those apples yesterday. this is my first apple pie. i am not a very good maker of crusts, and this one is my first personal success. rW had some hand in it. he encouraged and helped cut shortening when my arm got tired. it turned put pretty well. the filling is made from the Rome apples we picked saturday and one Honeycrisp apple to throw in some textural variety and sweetness. i spiced it with both cinnamon and allspice. now my grandmother can be a happy woman. it took 90 years to reach this point, but now she has the icing on the metaphorical cake... her wayward granddaughter has made a real pie. crust and all. knitting content soon, i promise. i have been busy on secret knitting. saturday was a very busy day. we will start with the top story. my super-awesome cousin gave birth to her first child saturday morning. His name is Collin Thomas, and you can see the photos on his very own website (with commentary by his father, a man of eccentric humour.) which i am sure will have frequent updates of cuteness. the family expansion was happening in cleveland, so here in the mid-atlantic, we had a pretty typical weekend on our hands. rW and i took a trip out to Mt. Airy, Maryland to pick apples and a pumpkin. it was fun, and we took a bunch of pictures. i even did some knitting on a mitten in the car. the only hitch in the day was some inclement weather. we got pretty wet, but it was worth it. the pumpkin we found is as perfect as any pumpkin i have ever had. it has one slightly flat side, but someone clearly picked it up off its side and set it upright before it finished ripening and turning orange because it doesn't have too much of a deformed side. i sort of also wanted to take home one of the fancy bright orange pumpkins that were already picked, but i am happy with our guy. rW will have to name him because i am bad at that sort of thing. later saturday evening i went to a cocktail party at my friend Jen's apartment. i met her new man (well, new so to speak, they have been friends for a long time, but they started dating this year.) and caught up with a few old friends. all in all, fun and busy. last night i made 17 bean + barley soup. these are the beans before i soaked them. pretty! i served it up with pumpernickle bread and halves of delicata squash stuffed with veggie sausage (or "fauxusage", if you will). it was delightful. i had never had "sausage" stuffed squash before, but as i said of faux meat technology... there have been advancements. i am pretty sure that fake sausage just tastes like smoke and spices, but it works for me. i am on a store model knitting spree. 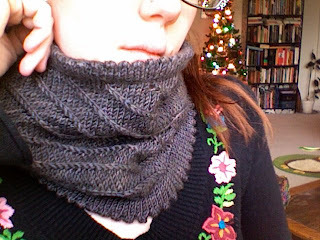 i have a cowl on my needles right now that is made of cotton and angora blend--fluffy! this is the 2nd one this week that i have designed myself. photos soon. remember the head shots i had taken on sunday for the company website? the proofs are up, and now i have to decide which 5 i want to have edited. here are 52 to pick from. please help me. photos are here. i am fairly certain they won't be up much longer than a week. leave your favourites in the comments by photo number. or maybe i should use my self-portrait? i have been sent public and private comments about how i handled my ear infection. specifically how i handled in incorrectly. yes, i realize there are ear, nose, and throat doctors in the world. i also realize they handle these things much better than a GP, an urgent care center, or Minute Clinic ever could. i even went to one the last time i had a throat in infection that kept me in bed for 5 days. but specialists cost a lot of money. health care in general costs a lot of money. the kind of health insurance i qualify for as a "young" single female in the state of maryland can be described as either "under insurance" or "$800 out of pocket per month". to put that figure in perspective, i currently spend as much combined on my car insurance, student loan repayment, and rent every month. well, some insurance is better than no insurance right? not really. when i had health insurance, i could never find someone who was qualified to call themself a doctor who would actually see me. i didn't have expensive enough insurance to be seen by someone fancy and reputable. when i went to the ENT, 100% was out of pocket, even though i had insurance. now, without it, i am the pariah in the corner at urgent care. i try not to get political or turn my blog into a PSA, but this gets my goat. the faceless uninsured are not just the homeless black children living in the inner city you can readily conjure up in your head when you watch the evening news. a white woman living in a small hippie town next to the big city. someone with a car, a roof over her head, her own business, a job at another small business, and a terminal graduate degree. 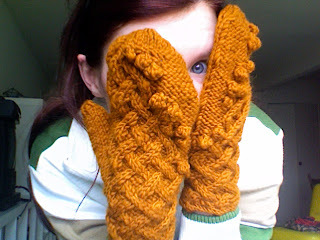 i have been doing secret holiday knitting that the blog readership cannot know about (hi family peoples. what up.) so i will share a so-not-me project here today. this is a store model for the shop. 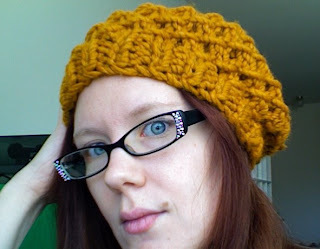 i designed the pattern to be given out with the yarn, which as you can see is sort of silly. 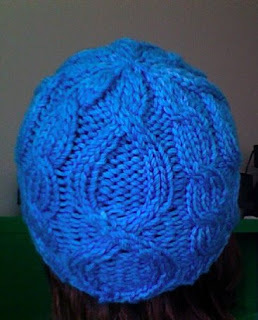 i plan to see if i can knit a second one in a plain yarn for more long term use in the shop. knit in one skein of Scholler+Stahl Sweet Girls (100% acrylic) on size US 10.5 needles. fits a toddler or young child (16"-18" head). i started knitting this and then realized i didn't have a real plan. so i set it aside, designed it out in my head and finished it in one sitting yesterday while watching the movie Airplane!. 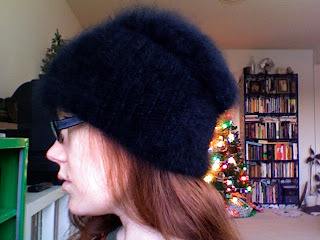 because it is store model (needs to be easy to knit) and it the yarn is a little tricky, i knit the hat flat and seamed it rather than knitting in the round. the ruffles are goofy. you make them by grabbing only part of the ruffled section of the yarn and knitting or purling only the edge. on the knit side, you purl the ruffles, on the purl side, you knit the ruffles. it is opposite in order to keep the ruffles on the right side of the work. strange. the cute thing about the pattern (never mind the yarn) is the drawstring top. a little girl can pull her ponytail through the top of her hat. cute! i had my head shots taken on sunday (and had to miss a BBQ at my aunt's house for it! grr!) and they went better than the horror show in my head. hair and make-up was easy. she didn't lecture me about home hair dye or going to a dermatologist, so that was good. photo shoot was also good. we will see how the pictures turn out. i think i was done up a little on the vintage pin up side, and my glasses were problematic with glare so i had to take a lot without them. but i am sure there is something i can use. last night i made a favourite dish from my childhood--macaroni and cheese omelet! it is pretty much exactly what it sounds like. macaroni, egg, extra sharp cheddar cheese, fake bacon, salt, pepper, milk, frying pan. cook it. delicious. prior to last night, i only have eaten it once since i went veggie. it is sort of bland without the bacon. now fake bacon technology has caught up and i was able to make it with the fakcon (as rW and i like to call it) and enjoy a slice of childhood once again. i also substituted in whole wheat macaroni. i bet the whole thing could be made vegan, but i am opposed to soy cheese for personal reasons. that was the last time i wrote an update. egads. much has happened. and unrelated to all of those things which i will detail, is this photo rW took of me. i like it because i am relaxing on the floor betwen the couch and the coffee table--a favourite spot. AND (!!!) because i am wearing the Gathered Pullover i knit for myself. i opened 3 shows. Busytown (children's musical), Temptation (political satire with costume party! ), and The Serpent Woman (fantasy/commedia). i was sick from september 26th through.... well, probably this past wednesday, but i am still not at 100%. it started with a bad cold that spread into a double ear infection that eventually also became tonsillitis in one (and only one) tonsil. then i went on antibiotics that made me 500% more sick and didn't cure the ear infection. so i could neither eat nor hear and was still in tech. now all the shows are open, and my ears are still about 40% clogged, but i am told it can take up to a month for ears to fully clear and webMD says i shouldn't really get too worried unless i still have hearing loss after 3 months. 75% of a christmas gift. 2 mittens, each from a different pair. 20% of a hat. and one whole side of the edging on the christening shawl. i made a mistake on that on day 2 of tech #1 and it has been sitting ever since until i have the time and brain power to tear back and resume. jess has assured me the bambino will not be baptised until december, but i want to get it done before his arrival as a point of pride. locked myself out of the apartment. twice. rW and i have passed the 6 month mark. i have started to sew for myself again. my car had to go to the doctor. 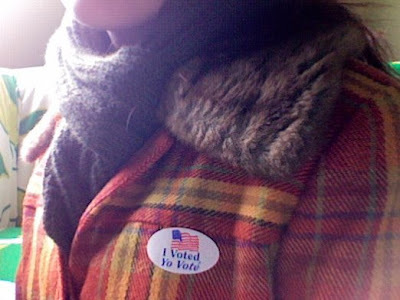 i registered to vote in maryland. i started my christmas shopping. and i discovered a new bakery. tomorrow i am having a head shot taken for use on the company website and programs. i am unsure how i feel about this. it means i need to go wash my freshly dyed hair so it will be manageable tomorrow for the hair and make-up gal. i hope i get to wear my glasses. rW and i finished our 750 piece puzzle. it was fun. i used to do puzzles with my mom when i was a kid, and we always had a good time. she is a very "make your own fun" sort of person, a quality rW also possesses. now, i don't think i am going to devote myself full time to puzzling by any means. i still find knitting more relaxing. after the big old 750, we put together two 100 piece puzzles. they came as part of a ten puzzle set (two 100, four 300, four 500). roll of tape shown for scale. they are very small, and both of them took us less than an hour. sure are cute and americana. last weekend, i bought a pumpkin at safeway, and tonight i was going to draw a face on him when a sad discovery was made.... he has the cancer. one small spot of rot on his bottom where his skin was pierced, probably in transit. it does not seem like much, but he will spoil quickly. Owloysius tried to comfort the little guy but he looked decidedly nervous when i placed him on the ground level windowsill outside rW's building. i am in tech this weekend, so busy times and little time to report back. i hope to ave pictures of this show to share. it rocks. the fun part of the full week. sorta. rW and i have made some good progress on our puzzle despite only working on it intermittently. we did most of it last saturday and another hour of puzzling on one week night. we mostly have water and rocks left... some trees. i did all of the sky at once. i may have already bought a new puzzle. maybe. ahem. i can tell you i bought new sneakers yesterday. all of my shoes are dying, and i needed something to replace the 4 pairs of canvas/rubber combos i pitched over the last few months. i also threw out a pair of real sneakers yesterday, but i may have to ask santa for some of those. last night we went out to the beer store and discovered they had 7oz shorty high life! high life is my favourite cheap beer. i got the 8-pack of shorties for $3.49. these may be the most perfect thing ever because i don't always want a whole beer. meet Owloysius. he is a fan of the champagne of beers too. i have done a lot of knitting on the shawl this week because my car had to go to the doctor and i had a lot of time on the metro. also, i sat (knit) through a first rehearsal of one show and the design run for another. i finished up the body of the shawl, knit the eyelet border, increased to a multiple of 8, and started the knit-on edging. the edging experience has been a doozy. many false starts and corrections, but i think i have it now. 3 repeats down 51 to go! this is piece of unblocked lace. um. that's why it looks so goofy and relatively bad compared to other projects i have shown here. don't worry, it will be pretty before the end of next month! this is the christening shawl for my future nephew. mama knows i am making it for the bambino, but i hope my FBL doesn't tell her i posted a progress photo. ahem. this project is really giving me a run for my money. i am a new lace knitter, and this has been a learning experience. i have decided that non-repeating patterns are difficult for me. i can't memorize the knot motif so i am glued to the chart row by row. 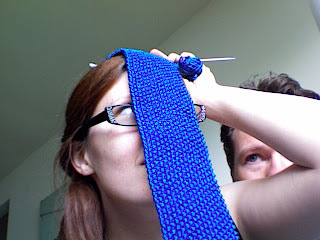 i would be in agony of i were knitting this to a full stole size with repeats of the knot chart. and it will be beautiful and worth all the careful chart reading when i have knit the last stitch, blocked it so it looks like something and a new wee person is wrapped up in it. i finished rW's tie. it is beautiful. i don't have modeled photos yet because we have both been very busy this week. i had 2 first rehearsals, 2 production meetings, 1 nineteen hour work day, 3 shifts at the shop, costume fittings, and a partridge in a pear tree. i'm glad it was only a 4 day week! after the crazy week, rW went out for dinner last night. it was fantastic. we went to Franklin's in Hyattsville (why do they not have a website? or why is it so hard to find?) and i was pleased this go around. i used to go there all the time in grad school, and it was great, but over the last year, it was really sucking. i was pleased to see that this time we had good food, fast service, and a wonderful server. this last point is especially important to me. i have had the lamest servers there every time i have been in the last year and a half. we had a relatively simple dinner. beer (yay brew pub! ), fresh made rolls, and salads. my salad was mix greens topped with grilled peaches, rd onion, blue cheese, pecans, and a sherry vinaigrette. rW had a salad of mixed heirloom tomatoes, red onion, and slices of feta cheese finished with a lemon dressing. i cannot even describe how delicious the lemon dressing was on his salad. it is even difficult to describe the dressing itself, it was so unusual. we went to the attached general store after dinner, and it inspired us to buy a puzzle. a jigsaw puzzle. yes, we are preparing for our geriatric years now. 750 pieces of pretty coastline. i think it is an italian sea town. i will keep you posted as the puzzle develops and my grey hair comes to visit. last week during previews for my latest show i was forced (really, my arm was twisted) to start a new project i could knit in the total darkness of a theatre. voila! new tie for rW in the works. it is knit in 100% italian silk making it a treat for both of us. i think this color will be very nice with his eyes.